The journal publishes only original (unpublished anywhere else) work, grounded in all areas of sociology, social/cultural anthropology and cognate disciplines such as cultural studies, social policy and industrial relations. We also encourage the submission of research articles that cover emergent, borderland and unexplored topics in both sociology and anthropology. 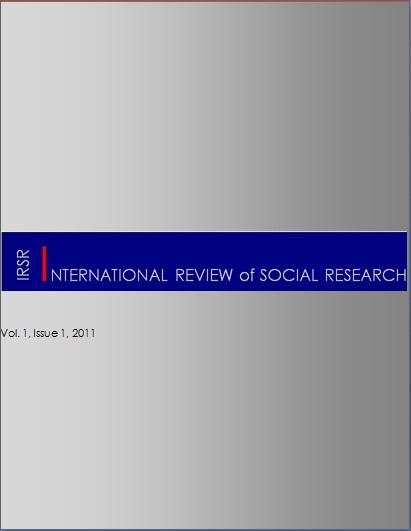 International Review of Social Research publishes articles in English. In order to assure the quality of writing in their English-language submissions, authors for whom English is a second language are encouraged to have their manuscript professionally edited. A list of editing services providers can be found at http://authorservices.wiley.com/bauthor/english_language.asp. (All services are paid for and arranged by the author. The usage of these services does not facilitate acceptance or preference for publication). Articles should have 4,000 to 8,000 words, including references. Articles longer than that will be rejected. Both titles and subtitles should be short. Throughout the manuscript, subtitles are not to be numbered. The research questions, key argument, methodology and main findings should be outlined in an abstract of 100-150 words. The abstract paragraph should be different than the opening paragraph of the article. You may find some useful advice on abstract construction here [http://authorservices.wiley.com/bauthor/seo.asp]. Four to six keywords should follow the abstract paragraph. Each manuscript should have a separate page containing: (1) the title of the article, (2) author(s), (3) institutional affiliation of the authors, (4) e-mail address(es) and (4) acknowledgements (if relevant). Important: When more than one author, please indicate in a footnote on the title page the corresponding author. Lengthy literature reviews should be avoided. Authors should engage only authors and references relevant for their topic. Please avoid excessive jargon and use readable style. If acronyms are used, they should be defined when they first appear in the text. Please use plurals instead of he/she. For emphasis, use italics, but please keep them at a minimum. Please do not use bold or underline. Use italics for title of books, newspapers, novels when they appear in the main text. Spell out numerals under 10. Use “per cent” in the text; “%” sign should be used in the tables. References should follow this model: (Author(s), year: page number). Quotes longer than 40 words should be indented without the use of inverted commas. For quotations within the text please make sure to use single inverted commas on all occasions, except for a quotation within a quotation which should be placed within double inverted commas. Should be kept at a minimum and should be placed before the references. Only works cited in the text should be listed in the bibliography. Crenson, M. A. (1983) Neighborhood Politics. Cambridge, MA: Harvard University Press. Lakoff, G. and M. Johnson (1980) Metaphors We Live By. Chicago, IL: University of Chicago Press. McKinnon, S. and S. Silverman (2005) (eds.) Complexities: Beyond Nature and Nurture. Chicago, IL: University of Chicago Press. Caplan, J. (2001) ‘This or That Particular Person: Protocols of Identification in Nineteenth-Century Europe’ In Caplan, J. and J. Torpley (eds.) Documenting Individual Identity: The Development of State Practices in the Modern World, pp. 49-66. Princeton, NJ: Princeton University Press. Cameron Hay, M. (2010) ‘Suffering in a productive world: Chronic illness, visibility, and the space beyond agency’. American Ethnologist, 37(2):259-274. Lim, C. and R. Putnam (2010) ‘Religions, Social Networks and Life Satisfaction’. American Sociological Review, 75(6):914-933. Johnson, K. (2011) Multiplicity and Scale. MS.
Johnson, K. (2011) ‘Title of Article’, URL. (consulted day, month, year). All tables should have titles placed above and the source(s) places beneath it. They should be numbered consecutively. Tables and charts should be placed at the end of the article, after the references section, with an indication in the text as to their placement. Any diagram or photograph should be named “Figure” in the manuscript. Black and white photographs are accepted, as long as their resolution is high (more than 300 dpi). Images should be sent or uploaded separately from the main text, with an indication in the text as to their placement. Before publication, the corresponding author will receive proofs. They need to be returned to the editors within 15 days since received. After publication, the authors will receive a printed copy of the journal. Occasionally, the editor in chief will commission commentaries for selected articles. Unsolicited comments will not be published. Occasionally, the International Review of Social Research will publish debates about emerging theoretical and methodological issues, in order to provoke critical reflection. Normally, these are commissioned, but they may also be suggested to the editor in chief. They should have between 3000 and 5000 words and should focus on a number of two to six books that discuss similar topics. The style set out above for articles should be followed; “Debates” essays will also be peer reviewed. International Review of Social Research does not publish book reviews.